The “Vi” in Lord Vithoba’s name denotes knowledge and “Thoba” denotes shape. He is the shape of knowledge or the idol of knowledge. Another interpretation is that the word “Vitthala” is said to be derived from the Marathi word “Vit”, meaning brick. The reason behind the brick will be explained later in this article. “Ba” is used to denote “father” in Marathi. Lord Vithal/ Vitthal/ Vithoba is none other than Lord Vishnu, Lord Narayana or Lord Krishna. It is believed that Lord Krishna had incarnated at the end of Dwarpa Yuga on the eighth day of the dark fortnight in the holy month of Shravan (As per the Hindu calendar). He is lovingly called names like Pandrinath, Panduranga, Pandhairiraya, Vithai, Vithoba, Vithu-mauli, Vitthalgururao by his devotees. But the well-known and commonly used names are Pandurang / Panduranga and Shri Vitthal / Vithal. The word Vitthala is said to be derived from the Kannada (a language spoken in the southern parts of India ) word for Lord Vishnu. The worship of Lord Vitthala has been derived mainly from the Puranas. His worship has been made well-known by the teachings, poems, kirtans, and pads of great Vaishnava saints of Maharashtra from the 13th through the 17th centuries. They were saints like Sant Namdeo /Namdev, Sant Jnaneshwar, Sant Eknath and Sant Tukaram. Pundalik, a saint was closely associated with this shrine, and hence this shrine is also known as Pundarika Pura. One evening Lord Vishnu was moving about in the gardens of his mansion when the beautiful wife of Lord Indra (God of Heavens), Sachi approached him as she found his charms irresistible. Though she was a good and loyal wife, she found it difficult to stop herself from being carried away. But Vishnu rejected her advances and told her that her desire would be fulfilled in the next birth – when Vishnu took on the avatar of Krishna and Sachi became Radha. Subsequently, in the next birth Radha (Sachi) and Krishna (Vishnu) became lovers. Krishna and Radha used to meet each other frequently but stealthily in Dwaraka. But Krishna’s wife, Rukmini, could not stand their love and decided to punish Krishna . Without saying a word to anybody, she left Dwarka and undertook a severe penance in Dindirvana with the objective of winning Krishna back. Her absence turned Krishna into a repentant husband. He at once instituted a search for her. He went to various places but could not trace her. But he finally spotted Rukmini meditating in the dense jungles of Dindirvana. When Krishna went near her and tried to woo her back, she did not recognise him. The God thereupon launched a counter-tapa and stood before her. He stood there for 28 ‘yugas'. Both Krishna and Rukmini would have stood there for longer but were unintentionally intervened by one Pundalik or the great devotee. This Pundalik was undertaking a long journey for which he had hired two excellent horses for himself and his wife. During his trip, he lost his way and took refuge in a Kukkut Rishi’s ashram. In the ashram, Pundalik asked the sage directions for Varanasi but the sage told him he did not know the way nor had he ever been there. On hearing this, Pundalik ridiculed the sage but the latter held his peace. The matter rested there and everybody went to sleep. Pundalik however, was disturbed from his sleep around midnight on hearing some female voices. He came out of his room to investigate and saw three ladies sprinkling water in the courtyard to purify the ashram. The three ladies transformed the whole ashram and everything looked divine, fresh and beautiful. This phenomenon confounded the young Pundalik and on inquiring they revealed that the three of them were Ganga , Yamuna and Sarasvati and used to come to Kukkut's ashram every morning to repurify themselves. And although Pundalik was a sinful soul, he now stood absolved of his sins because of his having met them. The curiosity of Pundalik grew and he asked them about the secret of Kukkut's power. The three ladies told them that the sage had served and nursed his parents most faithfully and devoted all his life to that one aim. He had thus accumulated Punya. Pundalik, who in his early years was a self-centered man given to the pursuit of pleasure, was enlightened. He neglected his duties towards his parents, both of whom were old and ailing and bestowed all his attention on his attractive wife. Once they asked Pundalik to take them to Kashi for a pilgrimage but instead of helping them he sent them off on foot. From the sage’s ashram, he hastened back to his parents. He put them on horseback and took them to Kashi and brought them back most respectably. Henceforth, the care of his old mother and father came before everything else - even before God, as events were to prove. Seeing Pundalik’s sincere devotion towards his parents, Lord Vishnu was extremely pleased. He left his abode – Vaikauntha Lok to bless Pundalik. 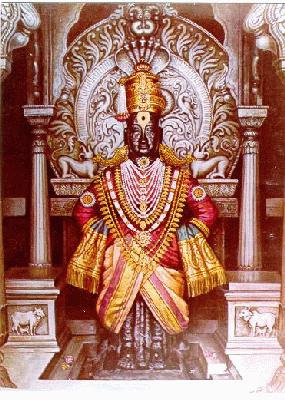 Once while Pundalik was massaging his father's feet at his Pandharpur home, Lord Vishnu appeared on the door of the ashram. Pundalik gave the Lord a brick to stand on and asked Him to wait until his duty was completed. The ever-loving Lord was so pleased with his devotee that He waited for him. When Pundalik came out, he asked God’s forgiveness for neglecting Him, but the Lord instead asked him to request a boon and it would be fulfilled.What more could a devotee ask when his Lord was standing right in front of him? Pundalik asked that He should remain on earth and bless all His devotees. His wish was granted and the Lord remained behind and is known as Vithoba or the Lord who stands on a brick.This form of the Lord is Swayambhu which means that His idol has not been carved or etched but it came into existence on its own. Vithoba = Vithavari ubha. Vitha means brick, vari means over. ubha means standing. Vithoba means standing on top of a brick. Why did Pundalika throw a brick for the Lord to stand on? When the Lord arrived and knocked on the door, He was not allowed to enter since Pundalik was serving his parents. Still, the Lord insisted, complaining that it was raining and there was no shelter for him from the rain. So, Pundalik tossed a brick so that the Lord could stand on the brick, find shelter under the roof and stand comfortably in the narrow porches in the houses that we have in India.